Between the Saudi army tanks and police barricades that are now canvassing the Bahraini capital of Manama, there is a new and scarier breed of checkpoints: those manned by civilian thugs. 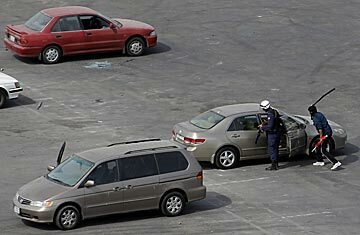 Masked and wielding bats, chain batons and even swords, they search cars for anything they construe as antigovernment memorabilia, including Bahraini flags, beating passengers should anything be discovered. Foreigners are not exempt. One Western woman said her car's tires were shot. In Hamad Town, a Sunni enclave near King Hamad bin Isa al-Khalifa's palace in Riffa, there have been reports of several beatings by thugs who patrol the area, clubs in hand. Opposition leaders insist that the mask-wearing vigilantes have become government proxies, used to intimidate protesters and foreign journalists. At various checkpoints, police cars have idled nearby while the thugs  some of whom look no older than 18  harass passersby. The capital is a veritable ghost town as residents abide by a curfew from 8 p.m. to 4 a.m. to avoid the gangs. Automatic rifles are often propped next to the thugs lounging on sidewalks. The opposition says that obtaining such weapons is nearly impossible for civilians without the express consent of the regime. Using civilian thugs is "a way for the regime to intimidate and threaten the opposition without getting its fingerprints on it," says Barak Barfi, research fellow and Middle East specialist at the New America Foundation. Barfi adds, "It's clear that there's an intimidation campaign being waged against both foreign and domestic media." On Friday, Foreign Minister Sheikh Khaled bin Ahmed al-Khalifa flatly dismissed allegations that the thugs were part of the government apparatus. Nabeel Rajab, head of the Bahrain Center for Human Rights, says thuggery is a second job and that "most probably these guys are from the national-security apparatus and the National Guard." He believes most of them are non-Bahrainis  the force is mostly composed of Yemenis, Syrians, Pakistanis and Lebanese. "They have beaten many, injured hundreds," says Rajab, who was himself arrested and beaten by uniformed security forces in the early hours of Friday morning. "They're everywhere in Manama and in the outside villages. They wear masks because they don't want to be known." Faced with a violent crackdown, opposition political party al-Wefaq said that it may have no other option but to strike back. At al-Wefaq's headquarters in Manama, party president Sheik Ali Salman says it's his belief that the thugs are the government's doing. He says, "If the government isn't supplying these people, how are they issuing leaflets in front of the police station? No one gets to stand in front of people and stop the cars and ask, 'Where are you from?' How are people going to trust this government if the government kills?" Sadiq al-Basri, al-Wefaq's counsel, claims there was contact between the thugs and the helicopters that circled over the protests, coordinating with guards on the ground. "They know what they are doing, where they are going, who they are going to kill," he says. On Sunday, the group issued an open letter to the regime, asking it to "erase all militia from streets and checkpoints," maintain responsibility for the protection of political societies and send the troops of the Gulf Cooperation Council (GCC) back to their home countries, including those from Saudi Arabia. Riyadh had sent 100 tanks into Manama on March 13. The government is unlikely to comply. On Friday, the Foreign Minister had said that tanks from "three or four" other GCC countries would likely be joining the Saudis.